Writing is a form of therapy; sometimes I wonder how all those who do not write, compose or paint can manage to escape the madness, the melancholia, the panic fear which is inherent in the human situation. 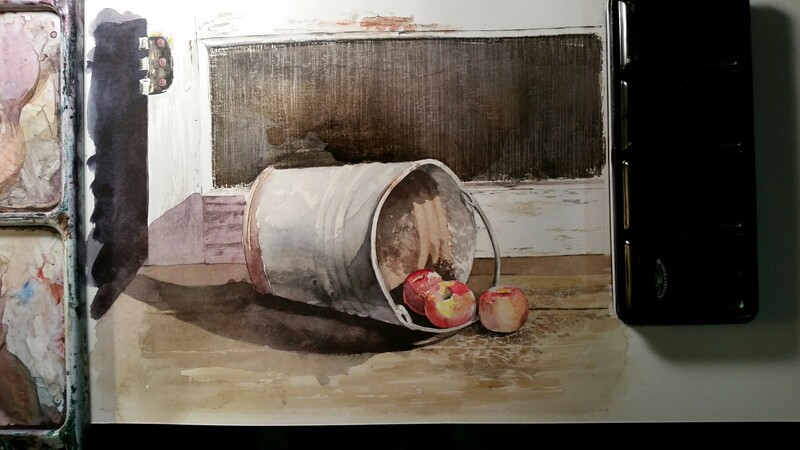 I did manage to escape into the cold garage studio for a little while this evening and chip away at this watercolor that has been hanging around for awhile now. I added some rust-stained washes to the screen door backdrop, and then spent the rest of the evening texturing the white frame of the screen door, trying to reproduce the scratches, knicks and stains that show the multi-layered history of this door and what it endured in someone’s home. Before stopping for the night, I also reworked the wooden floor beneath the apples, in an attempt to make the masqued areas look more like scratches and indentations in the wood surface. Now I’m back inside my warm home, glad that it is Friday night, and even more glad that an open weekend stretches out before me. I’m in the mood for reading, writing and reflection–in a word, solitude. I’ve been re-reading sections of Anthony Storr’s Solitude: A Return to the Self and Rollo May’s, The Courage to Create. The week in school has been a spastic one, and I took personally the line from the William Butler Yeats poem that I recorded in a blog earlier tonight, concerning the frenetic pace of society that consistently manages to flit past “monuments of unageing intellect.” Without apology, I do not choose that path. To me, worship is pausing to accept the quiet gifts offered in the center of this quick-paced life on earth. I journal to celebrate solitude. And I blog to remind myself that I am not really alone. We are called upon to do something new, to confront a no man’s land, to push into a forest where there are no well-worn paths and from which no one has returned to guide us. This is what the existentialists call the anxiety of nothingness. To live into the future means to leap into the unknown, and this requires a degree of courage for which there is no immediate precedent and which few people realize. This free event will be my final “large” art festival for the year 2014 (I will participate in two smaller ones later in October). For a number of years now, my preparatory steps for festivals have had that old familiar feel that bordered on weariness and encroaching inertia. But now that I have cut back severely on their number (from eight to only three this fall season), I’m feeling a resurgence of excitement along with the anxiety that accompanies the new and the unknown. My output of artwork has not flagged over the months, but my public displays have, and now I feel a sense of the new as I prepare to travel to this next venue. I don’t know when I’ve anticipated with more eagerness this chance to meet new crowds of people in the public marketplace with a chance of discussing and selling art as well as forming new friendships. I have really missed that and am glad that the opportunity is returning. Tomorrow promises to be another rewarding day at the high school as I have finished preparations for meeting my A.V.I.D. and Philosophy classes. The students have shown remarkable motivation and resiliency these past five weeks, and I feel closer to them with each passing day, indeed I look forward to seeing them again and finding out what kinds of new things we can explore together in this evolving arena of creative inquiry.
. . . those who present directly and immediately the new forms and symbols are the artists–the dramatists, the musicians, the painters, the dancers, the poets, and those poets of the religious sphere we call saints. They portray the new symbols in the form of images–poetic, aural, plastic, or dramatic, as the case may be. They live out their imaginations. The symbols only dreamt about by most human beings are expressed in graphic form by the artists. But in our appreciation of the created work–let us say a Mozart quintet–we also are performing a creative act. When we engage a painting . . . we are experiencing some new moment of sensibility. Some new vision is triggered in us by our contact with the painting; something unique is born in us. This is why appreciation of the music or painting or other works of the creative person is also a creative act on our part. All arts create symbols for a level of reality which cannot be reached in any other way. A picture and a poem reveal elements of reality which cannot be approached scientifically. In the creative work of art we encounter reality in a dimension which is closed for us without such works. Though I have been away from the blog a couple of days, I have not been away from the arts, have not abandoned the creative eros. Yesterday’s return to school after two snow-closure days pitchforked me back into the chaotic maelstrom of two schools trying to re-set the damaged bones of fractured schedules. The college had to reschedule final exams, students had to set appointments to make up missed exams because of transportation issues on icy roads. Yesterday I faced a hectic day in the high school, then spent the entire afternoon and evening at the college with final exams and scheduled make up exams. But I did extract some quality library time spent in the arts section on the third floor. I managed about ninety minutes of reading and reflection between appointments. And my soul was elevated. I didn’t want to leave that sanctuary. Today was unusually different. Coming out of the shower this morning, my mind and imagination shifted into overdrive. 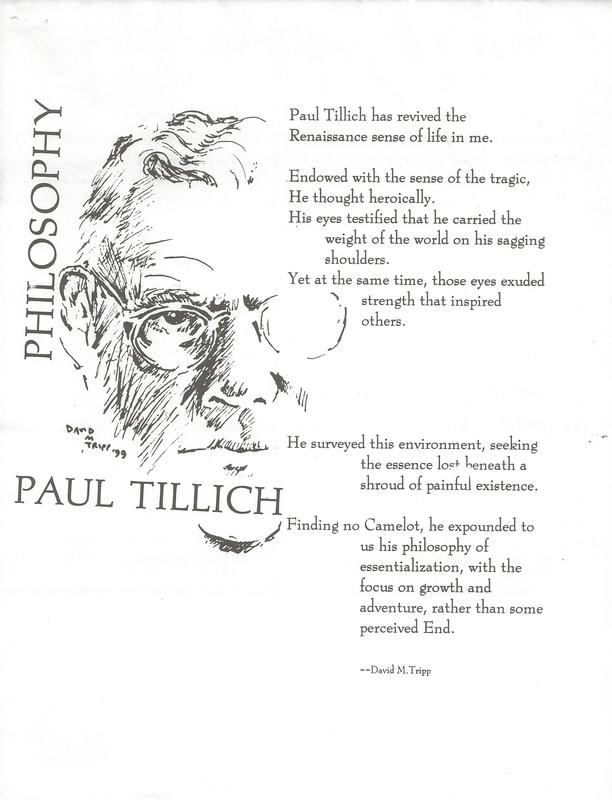 I was scheduled to lecture on Paul Tillich in the 7:35 Philosophy class. His ideas were tumbling about in my head, and I was having quite a time lining them up for presentation. The class was ready and receptive, and I felt that the creative spirit of the man visited us. If there is a heaven, and if I’m permitted to enter, then I would love for nothing more than to see Paul Tillich waiting at the harbor for me when my ship arrived, taking my hand and saying, “I’ve waited for this moment to meet you. We should have travelled that earthly odyssey together.” If only I could spend eternity asking him the questions I’ve saved up all these decades. After I finished my classes, I was able to return to the watercolor activity. The top painting is 99% complete and will be delivered Friday. The bottom painting is getting closer to completion. 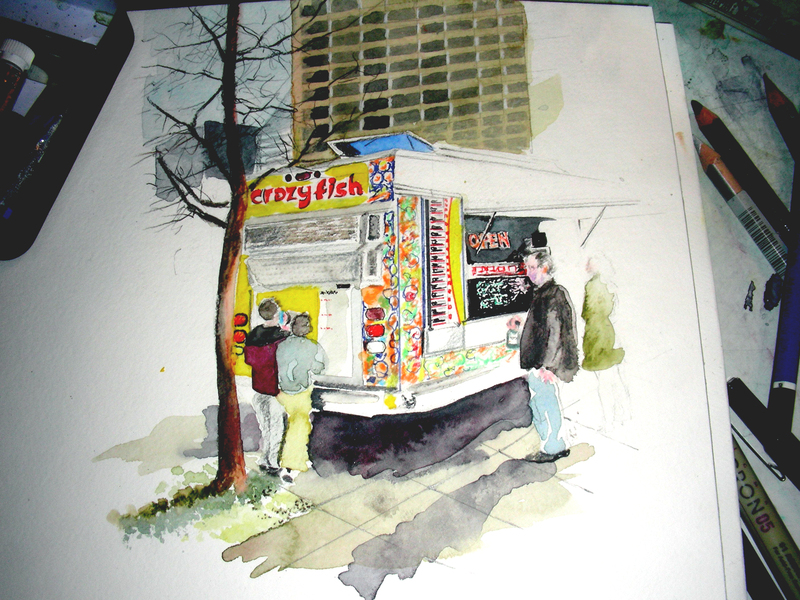 A third one, in progress, is lurking in the docks and hopefully I will complete it this weekend. I’ve made many promises this Christmas, and it appears that, thanks to the snow and ice days, I will manage to finish these tasks and (hopefully) make some patrons happy. Meanwhile, I’m restless with all my reading throughout the day and evening with Rollo May and Paul Tillich. I love reading about the creative process, the urge one feels to bring order to the chaos that greets us daily and to make something of it that speaks to our hearts and to others who look and appreciate. My life as an artist and educator has had its shaky moments. But as I draw nearer to this holiday season, I’m finding peace with a number of elements that have eluded me throughout the decades. There are a few things I believe I am coming to understand better, and with that new sense of understanding comes a measure of peace. Thanks for reading. It’s time to return to the painting. Imagination is the outreaching of mind. It is the individual’s capacity to accept the bombardment of the conscious mind with ideas, impulses, images, and every other sort of psychic phenomena welling up from the preconscious. it is the capacity to “dream dreams and see visions,” to consider diverse possibilities, and to endure the tension involved in holding these possibilities before one’s attention. Imagination is casting off mooring ropes, taking one’s chances that there will be new mooring posts in the vastness ahead. There were obstacles to clear before creating this morning. I am a sucker for NHL hockey and stayed up late watching Stanley Cup playoffs last night. School is out today for a Texas holiday, but I set the alarm for 6:00 anyway so I wouldn’t waste a good day with studio potential. 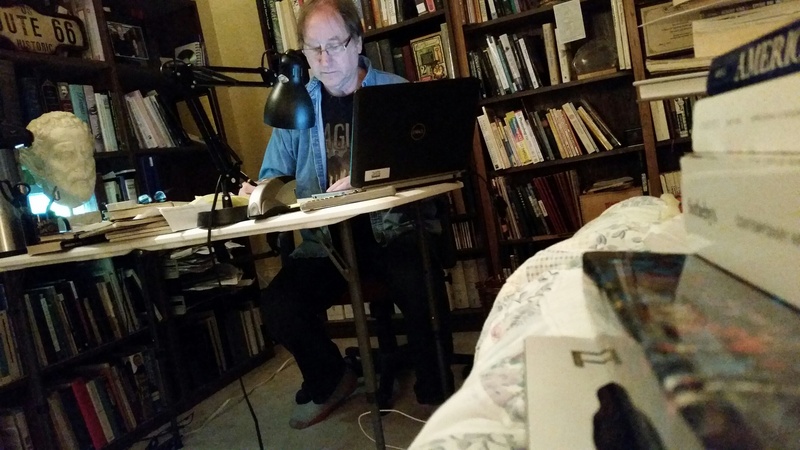 However, it is 41 degrees outside and gusting winds, and I knew the garage studio would be chilly, so I lingered awhile longer under the quilts, trying to talk myself out of getting up. I’m glad I pushed through anyway. A breakfast of fried potatoes, grilled onions and scrambled eggs shook loose the cobwebs, the coffee is made, and I’m ready now to face this screen door and see about redrawing the screen wire in front of the white areas of the coffee can, and then finding out how to diminish the starkness of the lighter masqued areas. Rollo May was my companion this morning, as I reached for inspiration and camaraderie in the studio. I’m ready to paint now. I journal because I am alone. Beneath our loquacious chatter, there is a silent language of our whole being which yearns for art and the beauty from which art comes. Tomorrow, I return to the classroom, and not with a heavy heart. Teaching has been my passion for over twenty years, but I must say openly that I have enjoyed the silence of the holidays, and the long hours of solitude in the Man Cave, painting. I have also enjoyed the armchair with great reading and heartfelt journaling. Tomorrow, voices will begin to fill my weekdays once again. 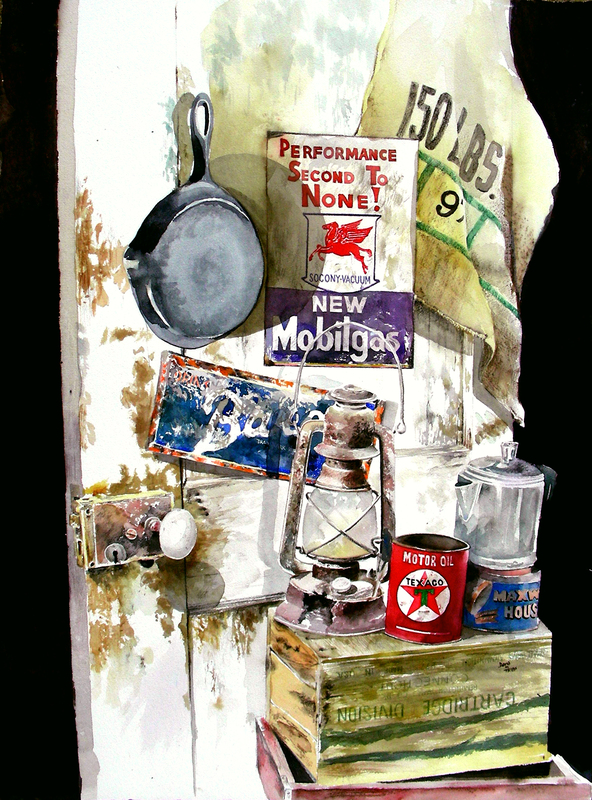 So, it is fitting that I finished this 28 x 22″ still life this afternoon, which has marked my holiday season. I am glad to sign it and move it aside. There is more art waiting to emerge from the abyss. Kindred spirits who have written me the past two days, and conversations I have enjoyed over the holiday have stirred me with a host of new ideas that I am ready to explore. And I resolve to paint daily (also read daily), and not allow my school responsibilities to eliminate what actually renews me day by day. The weekend has grown quiet, and I managed to find a Saturday night free of engagements, allowing me to return to my forsake man cave. The drafting table was a mess, and it took some time to get all my debris cleared away so I could resume work on this watercolor abandoned a week ago. School has been much too busy to my liking, and I’m grateful now for this hiatus, with Thanksgiving break just around the corner. Though I haven’t been able to paint for a week, I have had the warm privilege of opening Rollo May’s My Quest for Beauty–a book I ordered from Amazon eons ago, that finally arrived on my doorstep yesterday. Though my jealous cat crawled on top the open book on my lap for the first hour, I did manage to get into the text late last night, and spent quite a bit of time in it today (incidentally, the cat is all over me right now, as I attempt to type this entry). My firm belief is that one paints, as one writes, not out of a theory but out of the vividness of an experience . . . Rational thoughts follow to anchor theoretically the truths that already have grasped us as a vision. That lets me off the hook. I cannot explain to anyone why I have attached myself to doorknobs recently. These relics are what survive of my memories in my grandparents’ homes when I was a child. I have dropped the Proustian line continually as I blog, and I do enjoy the shock of recognition when I see an antique that unleashes those submerged memories from my past. Maybe some day I will be able to write eloquently about what I am painting. I arrived home from school this afternoon, ready to enter the silence of my Man Cave and give this drybrush sketch a final push. One hour later, I was finished. 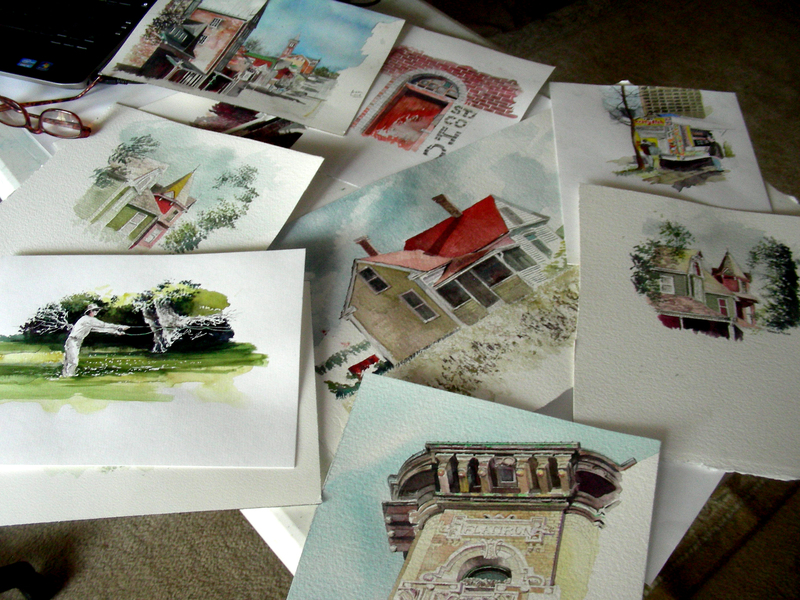 I surprised myself, completing an 8 x 10″ watercolor in three hours, with no intention of doing a “speed painting.” I suppose that my last few years of plein air experimentation has caused me to move more quickly and decisively. But honestly, I never felt that I was rushing this painting. In fact, the only reason I know the time invested is because of a habit of mine (begun during the plein air phase) to record my start and stop times. Honestly, once I get immersed in making art, I have no conception of time. Today was no different. Whereas I listened to Blues music yesterday, today I played a VHS tape of Andrew Wyeth interviews and just listened to his voice, his words, as I painted. Silence. 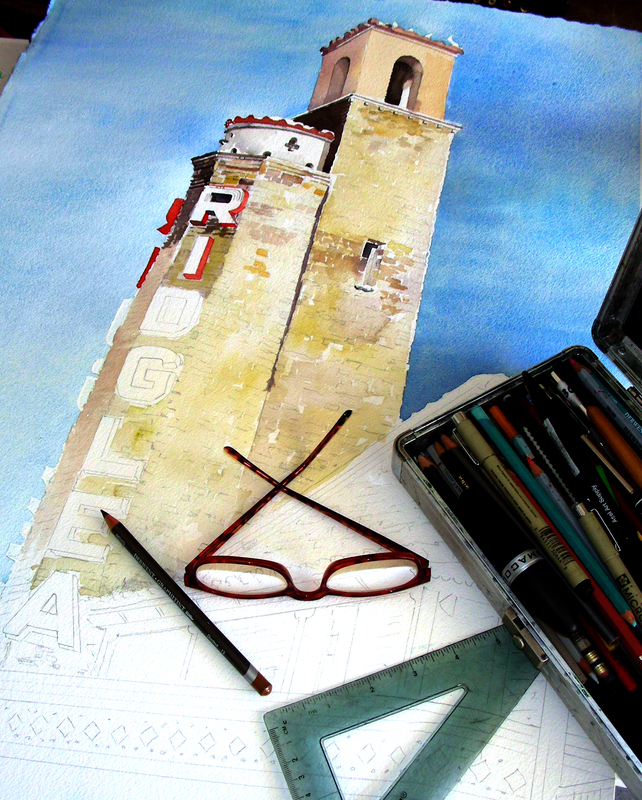 That is what I feel when I look at a watercolor by Andrew Wyeth or Edward Hopper. Silence. 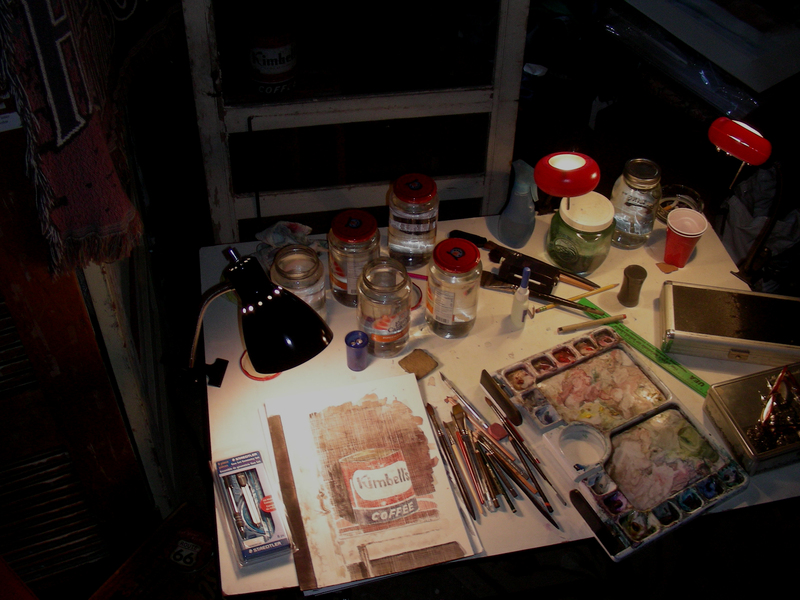 That is what I feel in my life right now, when my work day ends, and I enter the studio to explore new dimensions in sketching and watercolor. Silence. That is what I know in my heart when I read quality literature (and today I must certainly say that Rollo May had a wonderful calming influence on my Being as I contemplated this new enterprise. I have turned my attention to another antique door, complete with doorknob and locking plate. 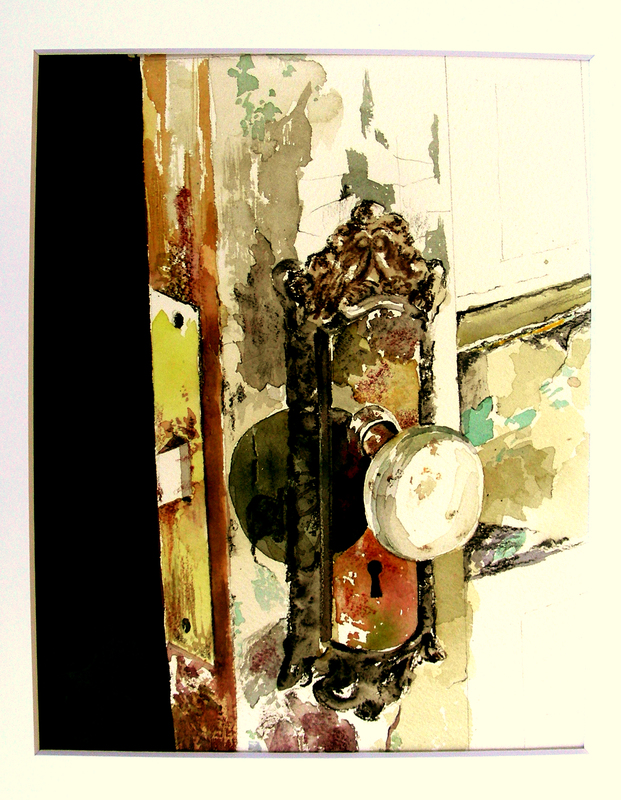 I am working on some preliminary sketches tonight, and if nothing arises to distract my attention, I shall attempt my second watercolor still life tomorrow in the man cave, of yet another antique door. As for tonight, I still have to pull together materials for tomorrow’s Philosophy class on Ralph Waldo Emerson (one of my prime muses). Good day to all of you. I am sitting in my Garage Studio with my eyes half-shut! I slept 12 hours last night, but only 3 the night before. It has caught up with me on this gorgeous sun-washed Sunday afternoon. What a tragedy. Friday’s humanities class at my high school was an absolutely magnificent moment for me, though we also had plenty of laughs, reviewing for an exam that showed the students didn’t absorb nearly what I had hoped for them. But Friday afternoon left me awash in desires to explore Kant, Rousseau and some of the Neo-Classical painters, which I did. 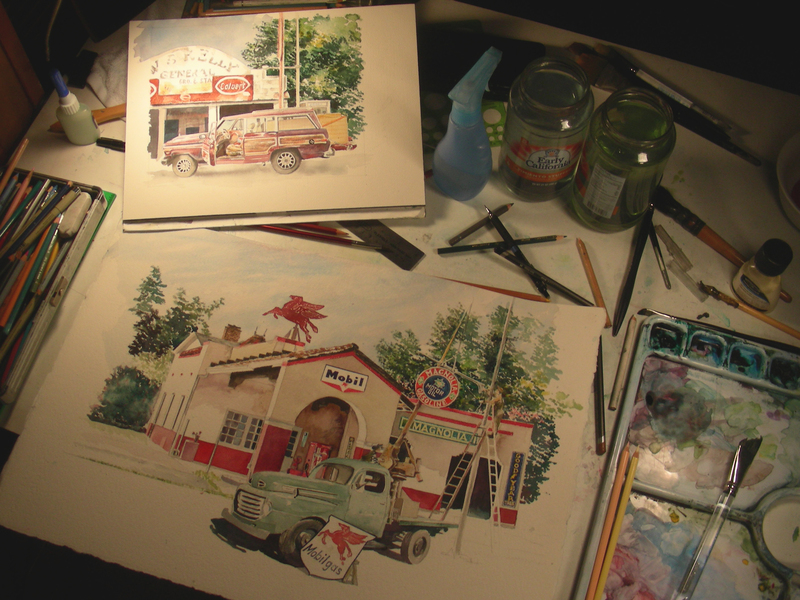 Then the urge hit late, late Friday night to do the foundational work on this full-size Ridglea Theater watercolor. I retired to bed at 3 a.m., but rose again at 6, and went back after it. Following that was a band rehearsal (we have an engagement in a week), then more work on the watercolor, and then a late Saturday night. Such intensity of consciousness is a real problem. One cannot have peak experience all the time, nor does anyone want to. Hence the infusion of Hindu meditation in our culture to give a constructive tone to solitude and to stop the machinery for a little while. Alcohol also serves to do this; it is a requirement, as Harry Stack Sullivan put it, of an industrial civilization, where it sets up a state of a partial withdrawal from the mechanical pressure. So. I’m pursuing neither Hindu meditation or alcohol. Just reading, journaling, listening to the gentle breezes outside my open garage door, and chipping away further at this Ridglea Theater watercolor. 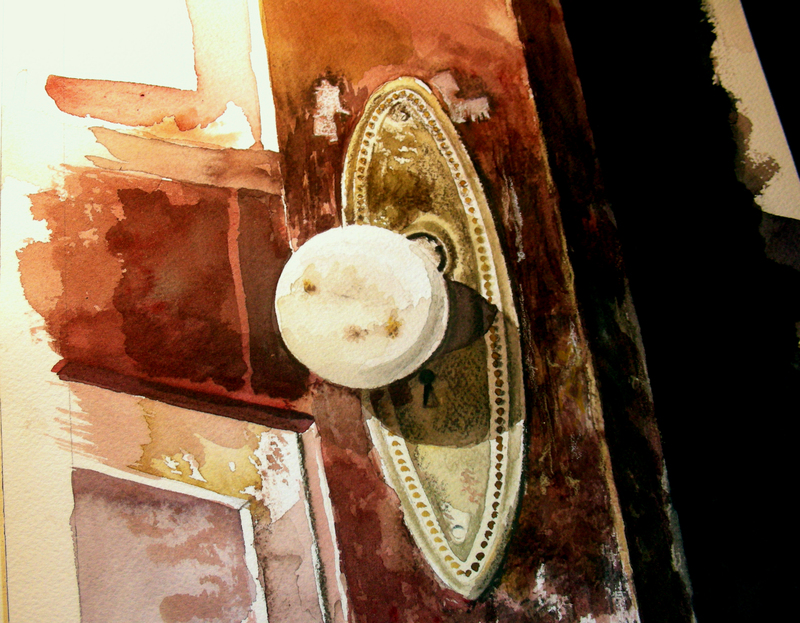 It is a most beautiful day out, and I am “amost” out, sitting 10 feet inside my open garage door with the sun beside me, jazz music playing on my stereo, Paul Tillich’s ideas surging through my being, and a watercolor emerging beneath my excited brush. Hopefully, I’ll post more later today. Thanks for reading.